Orangeries are a great addition to your home. Changing the relationship between the interior and exterior of your home. An extension of traditional bricks and mortar combined with the light and airy style. Orangeries are an amazing method of adding extra room in your house. There are so many great options such as a children’s room or a dining space. Perhaps a family room or a music room. All your wishes can be come true with a made to measure Cheam Orangery. Orangeries create a massive increase in living space for your home. If you can imagine it we can build it. Let our expert consultants open your mind to be what an Orangery from Cheam can offer. Limited only by your imagination, Cheam Windows Orangeries can feature any of our door and window products. For example sliding folding doors, casement windows, rooflights or lanterns. Not only will our doors and windows be designed to suit the orangery, the whole installation will look the part in your existing surrounding and match the character of your home. 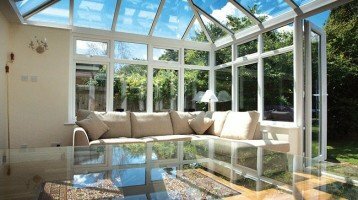 Cheam Orangeries – Beautiful Design, Extra space, peace of mind. Cheam Windows will take care of everything from start to finish. We are also experts in security so your extra space will be completely safe, giving you total peace of mind. We will look after the initial design, planning, all casework and construction. In addition plumbing, heating and electrics will also be taken care of. We will even help you with your choice of floor coverings, patios, paths and general landscaping. An Orangery just for you, our custom Orangeries will change the way you live and the way you use your home, giving you versatile, beautiful and flexible space. Let us work with you to create something totally unique.